Are those long pages filled with words getting to you while at church? Maybe you’ll benefit from a new version of the Bible that’s made from emojis. “Bible Emoji: Scripture for Millennials,” which stems from the Twitter account of the same name, was written by somebody only known as 😎 and was put up for sale on the iTunes store on Sunday for $2.99. It’s “a great and fun way to share the gospel,” wrote 😎 on the seller’s page. 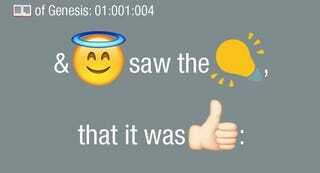 😎 is also the creator behind @BibleEmoji, which posts excerpts from the Bible in a combination of emoticons and slang. The creator, who prefers to remain anonymous, said that as a kid, they read the entire Bible and want people to use its stories and messages for good. “Bible Emoji” is clever in this regard. Emojis have become a part of our online vocabulary and younger generations use them frequently when communicating. If you think of emojis as just a simpler form of language, it was only a matter of time before a religious text was written with them. Plus, emojis and unicode characters can sometimes turn simple statements into puzzles, which can make reading them more fun. Try reading any of Carrie Fisher’s tweets and you’ll see what we mean.